All credit card payments are handled by NOCHEX with 128 bit Encryption, for your on-line security. Try our unique door entry handset finder tool. All orders are sent by ROYAL MAIL 1st Class Recorded Delivery. and must be signed for. The Comelit 2603U is a universal audio door entry handset. We supply to UK customers : Door Entry Handset and Door Entry Intercom Handsets and Spares, we have also introduced our unique intercom handset finder tool, where you can view high resolution images inside and out and 1 and 2 way door entry wiring diagrams of most popular 5 wire audio intercom handsets fitted in the last 25 years. 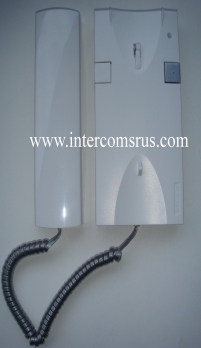 If you need a replacement door entry handset, use Intercoms R Us Ltd ~ the one stop handset shop.